Step 1 Heat the oven to 375 degrees. Put the sweet potato on a cookie sheet and bake until a knife easily pierces the meat to the center, about 1 hour. Meanwhile, generously butter six (one-half cup) straight-sided ramekins or individual souffle molds. Remove the sweet potato from the oven and set aside until cool enough to peel. Step 2 Peel the sweet potato and cut it into chunks. Puree it in a food processor with the egg yolks, brown sugar, orange zest, butter and salt until the mixture is smooth. If necessary, stop and scrape down the sides of the work bowl and continue pureeing. This makes about 2 cups puree. Step 4Beat the egg whites using a portable or stand mixer until frothy. Add the cream of tartar and continue beating until stiff peaks form. The egg whites will be ready when they form well-defined pointed peaks that stand straight up and retain their shape, several minutes. Step 5Sprinkle the chopped hazelnuts over the egg whites and gently fold them in. Divide the egg white mixture evenly among the ramekins, spooning them in a soft mound over the sweet potato mixture. Shake the ramekins gently from side to side to distribute the egg whites evenly. Step 6Place the ramekins on a cookie sheet and bake until the tops are puffed and golden brown in spots, 18 to 23 minutes. 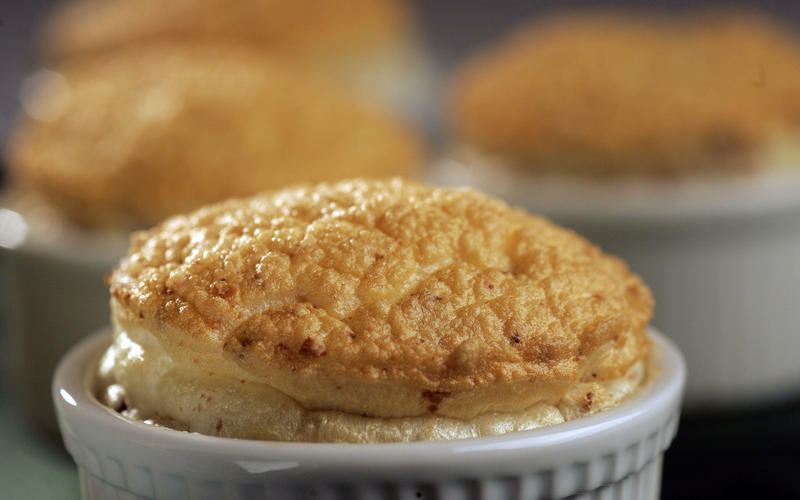 A sign of doneness is when the souffle becomes extremely fragrant. Don't over-bake, or the center will be dry. Remove from the oven; serve immediately. In Recipes-list.com we have selected the most viewed recipes from category - Main courses Sides Vegetarian . Enjoy the best recipes specially selected for you! Sweet potato puree with hazelnut souffle top is the right choice that will satisfy all your claims.